I dig Blade Runner. Depending on my mood, its easily one of my favorite movies. Sure, it's clunky in parts, and there are multiple cuts with different meanings, but this isn't a post about the arcane magic of Blade Runner. This is a post about a 13 year-old League raising an eyebrow in honor of Sean Young as a robotic noir love interest. It's not accurate to refer to the Rachael character in Blade Runner as a Femme Fatale. In fact, for a noirish crime drama, there is no woman trying to take Deckard out unless you count both Pris and Zhora, neither of whom use seduction in the "kill Deckard" technique and so aren't really femme fatales in the sense I understand the term. I saw Sean Young as Rachael before I was aware that Ms. Young had an odd reputation in Hollywood circles. And I am positive I had seen the movie before the Catwoman debacle. 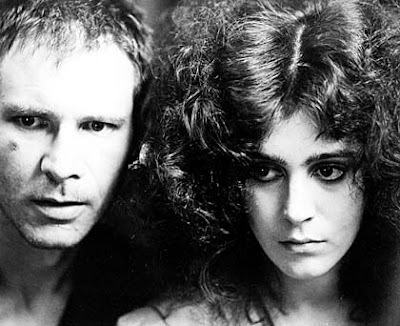 In all likelihood, I didn't know who Sean Young was when I saw Blade Runner the first time. 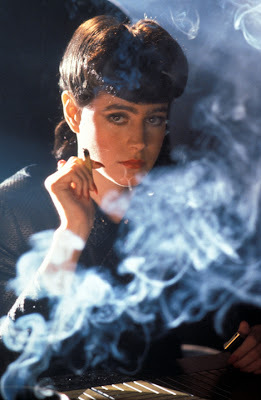 Rachael the replicant is smokin'. Not to belabor a point, but I might add this movie also had Daryl Hannah in punk-aesthetic and Joanna Cassidy running around in nothing but glitter. But I guess, you know, the whole "trying to kill you" thing was a bit of a turn-off when I was 13. 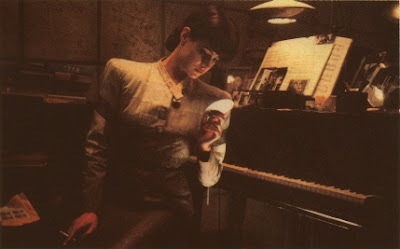 The character of Rachael was (spoiler alert) of course a "replicant", ie: a synthetic human. More human than human, if you will. And, of course, that lent a certain odd, doomed mystique to the character as she progresses down her character arc and adds her to the distinguished line of Lady Robots of Interest (we can begin with the robot Maria from Metropolis and follow through Ghost in the Shell). Mostly, though, Rachael personified the elitist ice-queen of the detective flicks, sometimes the wife or daughter of a shady millionaire in Chandler novels. Like other good ice-queens, Rachael was tough on the outside, but once past the frosty exterior, she falls for the bedraggled detective. And, of course, what guy doesn't want to see himself as a tough guy detective (no, it doesn't matter how young or old)? Rachael examines a note from Rick. She will check "Yes, I like you". Aside from a shot or two of Sean Young's thigh when Deckard and Rachael get their groove on, Rachael is always dressed in throwback outfits, lifted from the Lauren Bacall gowns and dresses, particularly the big-shoulders-era. I think we were to understand the wardrobe suggested what the script did not explicitly mention, that the suggested social role Rachael had been placed into was of the elite, living above the squalor of the streets. After her introduction, Rachael's huge fut coat seems oddly out of place on the streets of LA versus how it might look among the heights of the Tyrell pyramids. Whether Young developed Rachael's mannered speech and movements, I really have no idea. Certainly the casting away of those behaviors becomes part of the movie and character as she finds out the truth about herself. But, there's that toughness to Rachael that's necessary to a film like Blade Runner or, in fact, a believable love-interest for a hard-boiled detective film of any stripe. Rachael does, after all, pick up Deckard's gun and save the day when Deckard faces off with Leon. She does decide to take her life into her own hands once she realizes that her memories were nothing but implants. Depending upon your preference for which cut you want to watch, Rachael may or may not have much time. Let alone Deckard (late breaking spoiler. Sorry). So, a salute to Sean Young's portrayal of Rachael. That's a Replicant in the Media the League Once Dug. Go rent No Way Out immediately. I see no way I can't. Look any dame that can harass steely old James Woods so much that he files a lawsuit scares the bejeesus out of me. Yes, the legends, true or not, are quite mad.